I still have a small stash of a Cherry Liqueur the nice folks at Frederiksdal Gods are experimenting with. It's far still from the finished product - the plan is to age it in oak barrels - but it's already darn good and a nice alternative to Cherry Heering in my liquor cabinet. 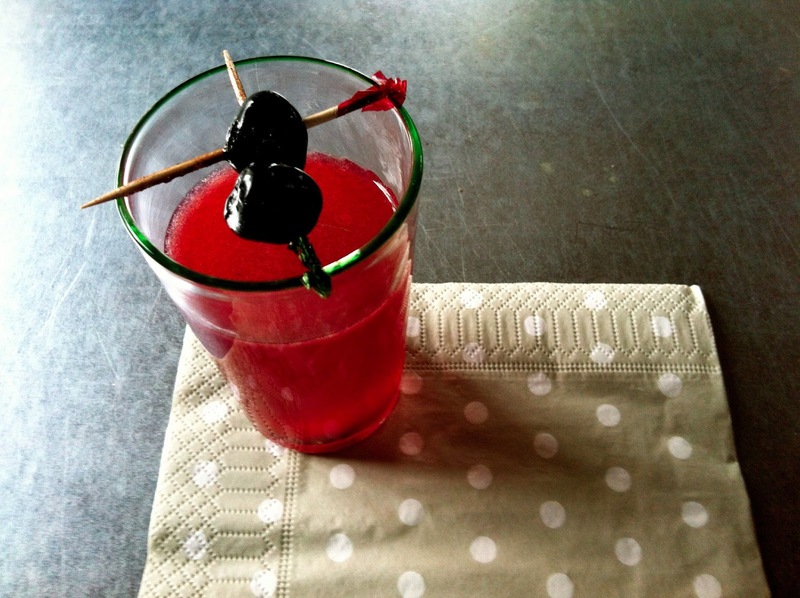 Cherry in The Rye is a lovely easy cocktail just begging to be served over ice on a nice patio watching even a weak spring sun go down, but that is still not possible in Denmark and it works well in front of a fire too. I believe it has been developed at Ruby in Copenhagen specifically with Cherry Heering in mind. 1 cl simple syrup - I used bergamot syrup made form equal parts sugar and fresh juice from bergamot oranges. Shake with ice and strain into nice glass for winter libation - or serve over ice for summer treat - you might even add a little seltzer or weak homemade tonic water for an interesting high ball.